We're so happy for the official 5.0 release, we'd like to share it with you, and for a great price. 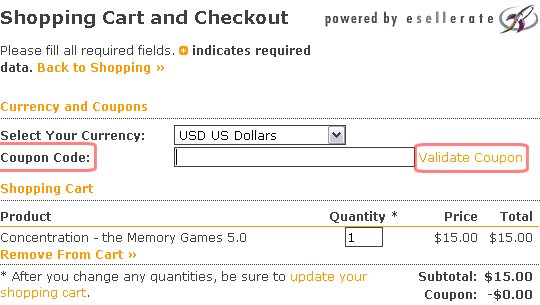 For 30 days, until the 18th of October, 2009 and if you use our Discount Coupon, a single license of Concentration - the memory Games will cost you 5 bucks less, only US$10. But be quick: this offer is valid only for a limited period! Discounted purchase is only available in the Galleus Web Store. 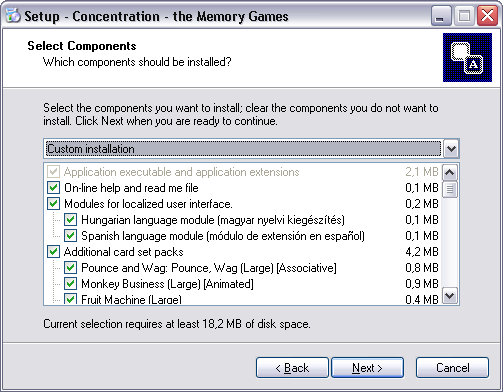 To buy Concenration - the Memory Games 5.0 for a discounted price, simply follow this link. Our five dollar discount will be automatically applied on your purchase. Should you have any problems with the coupon, please, follow our instructions on the manual purchase. First click here to start the checkout process. Accept the Terms of Sale, and review your shopping cart data. You'll see an empty Coupon Code field. Please, enter CMG50 into the text field and click Validate Coupon. If you get an error message, the Coupon Code has probably expired. If not, move on to Step 2. Coupon Discount: Step 1 • Enter Coupon Code and Click "Validate Coupon"
If the Coupon Code is valid, you can see the discount value just below the Subtotal in your shopping cart. Please fill in all necessary data and proceed to checkout. On the order confirmation page you can review you order details. 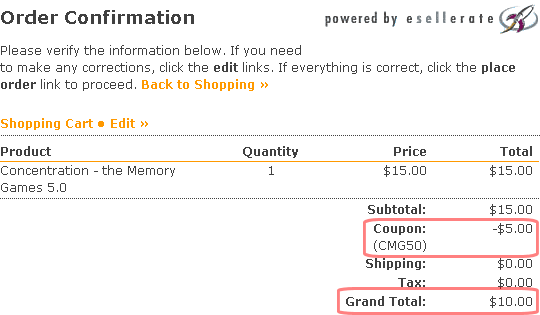 Please check that the discount value (Coupon) and the Grand Total reflect the discount. If everything is OK, place your order and wait for the confirmation email. Pounce and Wag are the first associative card sets available. 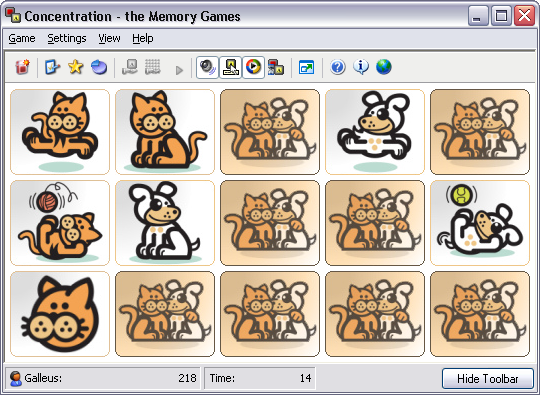 Each set has the same functionality as a simple concentration card set has, but you can adjust settings to play by matching related kitten and puppy images. This type of association exercises different parts of your brain than identical image matching does. To get more insight on these brand new card sets go their description page on the Galleus site. Try them, and then consider spending another minute to rate them. Thank you. 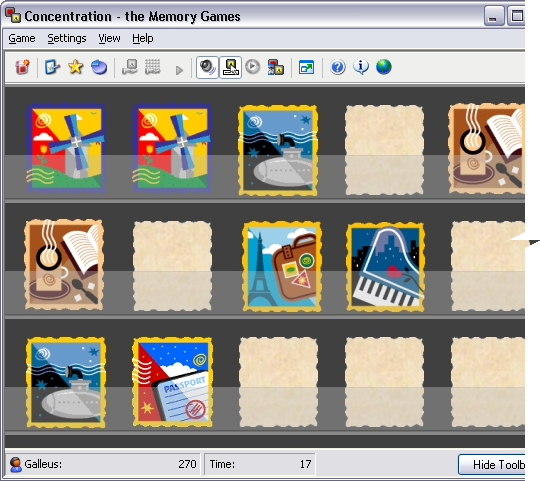 Version 5.0 of Concentration - the Memory Games is required to enable image associations. If you use an earlier version of the game, card sets will function as separate, individual sets. Concentration - the Memory Games is back with a new release, and the release covers various card set releases as well. 5.0 is a major update with numerous interesting features. Game play has never been so diverse. Version 5.0 introduces new game elements and additional preferences to help you find Your way to play concentration. Card sets with Animated card faces. Number of flipped pairs and successful flips shown in a tool tip over achieved points. Preview all cards before play. Give up option during play. Card set icons with alpha transparency. Old, 16-color card sets are optional at installation and can be removed. Repeat last individual card sound. The new Installer Wizard complies with the Windows installer UI standars. To get more insight on this brand new card set go its description page on the Galleus site. Try it, and then consider spending another minute to rate it. Thank you. 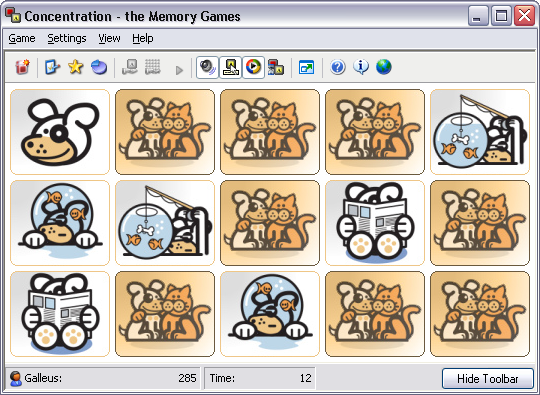 An animated memory game? Yes, it's true. This is the first animated card set for Concentration the Memory Games, but there's more to follow. Follow the adventures of a funny monkey, who somersaults, trikes, eats bananas, plays jokes on you. And the best part is: he's animated. A great card set for kids. 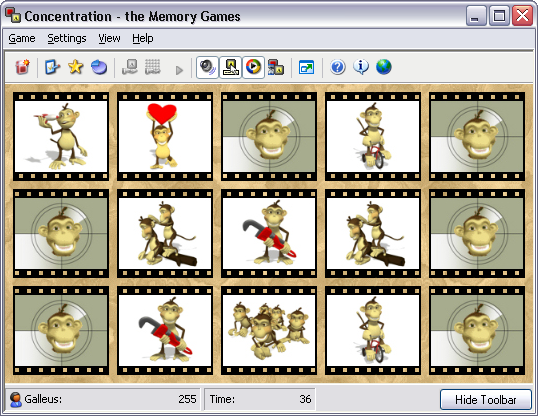 Monkey Business opens a new era in the history of Concentration - the Memory Games. The large card set is included in the basic installer, so hopefully more and more users will notice that it's now possible to play with animated cards.